How many more major one-day classics can Deceuninck-Quick-Step win this spring? As the pro peloton braces for the first weekend of big cobblestone classic races, the Belgian team’s line-up is brimming with top favorites for Friday’s E3 BinkBank Classic and Sunday’s Gent-Wevelgem. The team’s roster is formidable, but even the outright favorites are wary of how difficult these one-day races can be. Steels favors former world champion Gilbert and Stybar for good reason. The duo was instrumental in setting up Julian Alaphilippe’s brilliant win at Milano-Sanremo on Saturday. 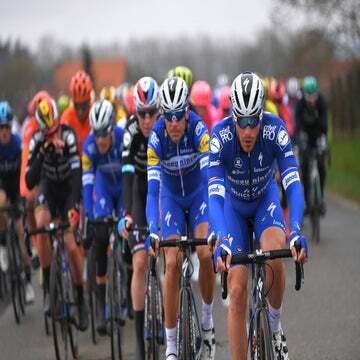 “La Primavera” was the fifth major one-day win for Deceuninck-Quick-Step this season. The Belgian team in blue has reason to ride into Harelbeke with confidence on Friday for the start of E3. Over the course of its 17 starts at the race, its riders have won the cobbled classic on six occasions. 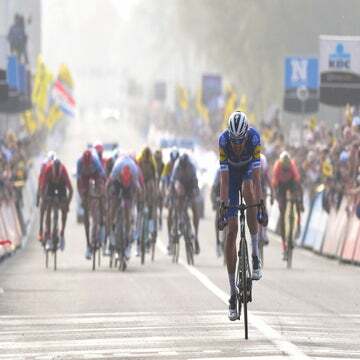 Two days later, Deceuninck-Quick-Step’s Italian sprinter Elia Viviani will look for redemption after an emotional second-place finish to Peter Sagan (Bora-Hansgrohe) in the 2018 edition of Gent-Wevelgem. Vivani was left crying tears of rage after the three-time world champion beat him in the sprint. Steels isn’t entirely relying on Viviani, though, as Gent-Wevelgem could be decided on the steep cobbled Kemmelberg hill, which the peloton will climb twice. The final ascent will be 30 kilometers from the finish. Gilbert and Stybar will join Viviani on the Deceuninck-Quick-Step team for Gent-Wevelgem. Viviani has four wins to his credit so far this season. His most recent victory was in the stage 3 sprint at Tirreno-Adriatico, where he beat his nemesis Sagan, who was second that day. But first, before he takes on Gent-Wevelgem, a race he has pegged as a key goal in his career, Viviani will race Wednesday’s Driedaagse Brugge-De Panne, another one-day WorldTour event. Viviani won this race in 2018. He’ll be joined by Kasper Asgreen, Fabio Jakobsen, Bob Jungels, Iljo Keisse, Michael Mørkøv, and Florian Sénéchal. “De Panne is a very windy race with a lot of open sections,” Steels added. “The narrow roads, hills, among which there’s also the Kemmelberg, and cobblestones will make it unpredictable. On the two local laps, they will take on De Moeren, where the wind could make it extremely hard.